Alfred Einstein, the eminent musicologist, declared this piano concerto to be Mozart's "most characteristic creationthe peak of all his instrumental achievement." The span of these amazing works provides a view of the "fascinating journey from a great talent to pure genius." 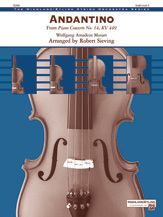 Unlike most of the Middle Concertos, Mozart considered this selection to be a "chamber" work, where spare instrumentation, and, in the case of the Andantino movement, a religious air, exhibit similarities to some choral works, like Ave Verum Corpus. This arrangement allows the eloquent melodic themes to be shared by all sections, requiring attention to detail and sensitive phrasing.